Partners. That's the theme for next year's Pageant of the Masters, the Festival of Arts program of "living picture" recreations of well-known artworks in Laguna, California. While people suffer many natural tragedies and inhumanely inflict injury and death, including the recent French soil bombings, the idea of loving partnerships continue to lift our spirits. One might do well to celebrate such beautiful partnerships. In this time of stress, thinking of beauty and harmony will result lift us all. Dominance: Does the Client Win or Lose? Dominance can be a good thing... or a bad thing. 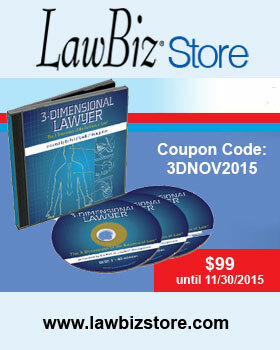 Are you as a lawyer a dominant lawyer? Are you seeking dominance for the benefit of your client? Or are you seeking dominance because that's the only way that you know how to practice? When I was in practice, I would fight and do whatever I needed to do to protect my client—and that's an important quality in a lawyer. On the other hand, some lawyers like to assert dominance for the sake of being dominant. I remember being frustrated with a number of adversaries who refused to take the time to review and really understand their case so that we could have meaningful settlement discussions in advance of the hard preparation for trial. When I came across somebody like that, I simply had to say to my client, "Look, this is going to cost you more money; but I have to prepare for trial, and there is no way that I can bring the other lawyer to the table to talk about a settlement that would be fair to both sides and accepted by both sides." Oftentimes, I would go to the courthouse steps, and there would be a settlement—a settlement negotiated exactly in accordance with my understanding of the Code and what each party was entitled to according to the Code. The problem was that the client suffered by having to pay significant additional costs that would not have had to be paid had there been a settlement early on. Does this mean that one lawyer was dominant over the other? Not really. We should always ask ourselves what we as lawyers do to help our clients preserve the limited assets that they have when they come to the table in controversy. What have we done to be part of the solution and not part of the problem?